1. 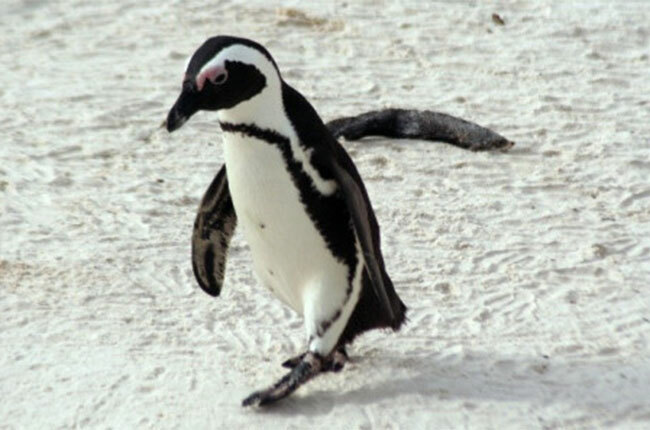 African Penguins are also known as Jackass Penguins and Blackfoot Penguins. 2. They eat mainly fish (anchovies, pilchards, sardines, mackerel and herrings) but they also eat squid and shellfish. 3. African Penguins are about 60cm tall. Boy penguins are usually taller than the girls and weigh between 2.4 and 3.6kgs. 4. African Penguins dive on average to 30m, but as deep as 130m. 5. They hold their breath under water for an average of 2.5 minutes. 6. African Penguins can swim up to 20 km per hour when hunting, but their average swimming speed is 7km/h. 7. They live until around 10 years old. 8. They start having babies at approximately 4 years old, and normally lay2 eggs in a nest that is burrowed in guano or sand. 9. The incubation period is about 38-42 days, with themom and dad taking care of it. 10. They live in colonies on 24 islands and along the coast between Namibia and Port Elizabeth.